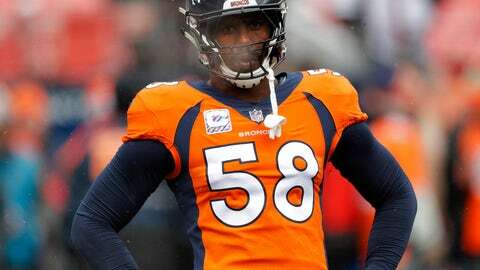 ENGLEWOOD, Colo. (AP) — Try as he might, Von Miller just can’t find anything bad to say about Philip Rivers anymore. That’s when the Broncos‘ star pass rusher got to know the Chargers‘ star quarterback at the Pro Bowl. Miller and Rivers face each other for the 15th time Sunday when the reeling Broncos (3-6), losers of six of their last seven, face the red-hot Chargers (7-2), who have won six in a row. Miller said the only reason he used to despise Rivers was the uniform he wears. “I just didn’t like him because he played for the Chargers,” Miller said. It wasn’t so hard for him to come around to liking the guy, however. “You ride on the bus at the Pro Bowl and in the locker room you’re just around the guys and you’re like, ‘Man, this guy’s cool. I like this guy.’ He’s a great father. He’s a great leader for the Chargers,” Miller said. “I know some guys over there in Melvin Ingram and Melvin Gordon and they say the same thing about him. Miller said so many other defenders are bothered by Rivers because of his talent and renowned trash talk. Miller has sacked Rivers 15 times , by far the most of any quarterback he’s ever faced and almost twice as many times as No. 2 on the list, Alex Smith, with eight. Rivers said Miller is even more dangerous opposite rookie Bradley Chubb. Combined, they have 17 sacks so far. Miller said Rivers has never been better. He’s getting the ball out quicker than ever, the Chargers’ ground game is the best it’s been in years and L.A.’s O-line is playing exceptionally well, all reasons Rivers has only been sacked a dozen times so far. “It’s the best Chargers team that I have played in my career,” said Miller, an eighth-year pro. So, who’s replaced Rivers atop Miller’s enemies list? “I don’t really have any enemies at quarterback,” Miller said. “Now, offensive linemen, it’s different. But you know quarterbacks, whenever I get close to them they fall or they run away. Those are the type of pants I like to wear. And pretty good at buttering them up, too.